I’ve been looking for my ancestor’s farm by scouring old maps and looking through old texts for clues. As usual, I turned to fultonhistory.com to search through hundreds of pages of old newspapers. After searches for “Josiah Warner” didn’t turn up much, I started looking for Warner with a combination of place names such as Catskill, Athens, Coxsackie, and Greene County. These searches turned up a few articles pertaining to “Jofiah Warner”. The description of the farm’s location matches previous texts. Josiah didn’t arrive in the area until right around 1800, so why is he trying to sell his farm only 5 years later, and where did the family live if this land indeed sold? Census records show Josiah Warner stayed in the local area—perhaps on this land or perhaps somewhere else. The mystery continues! My 3x-great-grandfather William Justice Warner and wife Mary Van Loan, his parents William Jackson Warner and wife Amelia Mix, and grandparents Josiah Warner and wife Olive Jackson lived in Athens, Greene County, New York. They were farmers by all accounts, with William Justice Warner’s son (William John) as the first to pursue a different livelihood. I’ve been searching for the burial locations for most of these people. William Justice is buried in Virginia, but his military pension records indicate his wife Mary died in 1871 in Athens, NY. I believe the older Warner’s also died in Athens. It dawned on me that as farmers, they were likely buried on their own land, but where was the farm? I grew up in a map publishing family and realized recently that I haven’t utilized old maps in my research. I haven’t found a landowners map indicating the precise location of the Warner farm, but I have determined its general location based on the descriptions. If you follow the squiggly line from the “S” (Murderers Kill) to where it intersects with a road coming from the Northeast, that’s the area. Interestingly enough, there is a notation for a “Mrs Warner” just below the “N”. As I begin to plan a research trip, this information will be invaluable in whittling down the location. 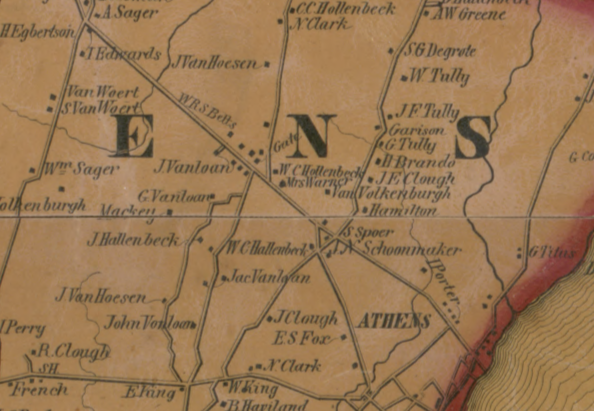 As a tip to others, many old maps and atlases are readily available online. Comrade William J. Warner, a member of Thatford Post, No. 3, G. A. R., New York, who died recently at the Hampton Soldiers’ Home, had a most eventful life, having taken an active part in three wars in the service of the United States. He was born at Athens, Greene County, N.Y. in 1812, and in 1837 enlisted for three years in Troop A of the Second United States Regular Dragoons. At the end of his term he re-enlisted for five years, and when that was served he again enlisted to serve during the Mexican War. During the Florida war he saw much hard service. At the battle of Caloosahatchee he had his nose broken by a blow from an Indian tomahawk, and was shot through the right thigh. He was one of Colonel William B. Harney’s company of thirty men who were ambushed by the Indians at Sanibel Inlet and all killed but three. The survivors, Colonel Harney and Privates Eastman and Warner, escaped in a canoe. They were five days and nights without food and scarcely any clothing, until they reached camp. In the Mexican War Comrade Warner was at the battles of Vera Cruz, Monterey, Palo Alto, Cerro Gordo, Buena Vista, Matamoras and the capture of the City of Mexico. He received a severe wound in the wrist at the battle of Buena Vista, and was discharged in 1848. In the civil war he enlaced in 1862 as a private in Company G, 159th New York Volunteers, and with that command took part in the battles of Irish Bend, Vermillion Bayou, New Iberia, Port Hudson, and Clinton, all in Louisiana. In April 1863, he was captured by Moshy’s guerrillas, but was retaken in a short time by Grierson’s cavalry. He was discharged for disability in November 1862. The last years of his life were spent among old comrades at the Hampton Soldiers’ Home.